ISRAEL KEPT UP air strikes on Gaza into today and Palestinian militants launched new rockets despite a reported ceasefire deal, raising fears of a return to open conflict in the enclave. Gaza’s Islamist rulers, Hamas, had said yesterday evening that an Egypt-brokered ceasefire has been agreed following a flare-up of violence just two weeks before an Israeli general election. “Hamas needs to know that we shall not hesitate to go in (to Gaza) and take all necessary steps,” he said in remarks broadcast on Israeli public radio. Those strikes were in response to a rare long-distance rocket attack from the Palestinian enclave that hit a home north of Tel Aviv and wounded seven people early yesterday. Today, he had been scheduled to address a pro-Israel lobby group and have dinner with Trump. Israel and Hamas have fought three wars since 2008, and Netanyahu is believed to want to avoid another one with unpredictable results ahead of the 9 April election. 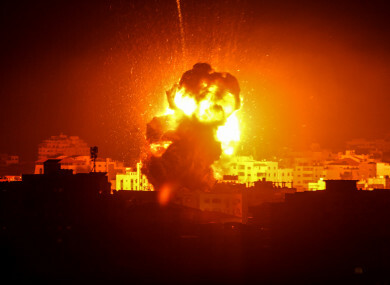 Gaza’s health ministry said last evening that seven people had been wounded as explosions rocked the enclave and balls of fire rose into the sky. A joint statement from militant groups in Gaza, including Hamas and Islamic Jihad, took responsibility for the rockets fired later yesterday in response to the Israeli strikes. Israel’s army said the rocket from Gaza that hit a house early yesterday was fired by Hamas. The Israeli house hit was located in the community of Mishmeret, around 20 kilometres north of Tel Aviv, police said. The rocket would have had to travel some 120 kilometres from Rafah in the southern Gaza Strip, where Israel said it was fired from. Yesterday’s rocket attack followed another rare incident on 14 March in which two rockets were fired from Gaza towards Tel Aviv. Both Hamas and Islamic Jihad denied they were behind the 14 March rocket fire towards Tel Aviv, raising the possibility it was launched by fringe groups. The Israeli army said it was launched by Hamas, but later Israeli media reported the army’s assessment was that the rockets had been fired by mistake during maintenance work. Email “Israel continues Gaza air strikes and Palestinian militants fire rockets despite apparent ceasefire”. Feedback on “Israel continues Gaza air strikes and Palestinian militants fire rockets despite apparent ceasefire”.